Abstract: The core idea of the research described in this paper is that the processes of self-organization commonly called „swarm intelligence” can be triggered by creating – through the collective effort of the whole population of agents – a „global cognitive map” derived from the interaction between the agents and the environment, and shared by all agents. We focus on multi-agent systems with human agents, and explore the technological means to automate the process of creating and sharing such cognitive maps, with the aim to induce controllable self-organization of the behaviour of the agents. Keywords: Multi-agent systems, cognitive maps, stigmergy, activity recognition, behaviour implicit communication. After several decades since Marshal McLuhan coined the term “global village” to describe the impact of the new computer and communication technology on our lives, there is a fast growing body of evidence that this impact goes far beyond any expectation. We are a gregarious species, and the increase of the intensity of social interactions is linked to physical and physiological modifications of the brain (). It seems that the Internet and the social networks literally change our physical brains, not just our habits. Therefore, the true consequences of this unprecedented expansion of the communications in the Internet era are yet to be evaluated. In this paper, we explore the inter-human communication from the perspective of multi-agent systems (MAS), and self-organization. One key concept for understanding the technologically mediated interactions between people is “to share”. We share more than pictures and music preferences on Facebook: in a general sense, we share a common environment, which may include the IT infrastructure we use, and also any other physical, logical or cultural elements we can sense, and influence through our activity (see Figure 1). This mechanism of indirect communication and coordination by means of traces created and sensed in a shared environment has been called “stigmergy”. It was first described by Grasse (), and later raised a great deal of interest as key factor of the “swarm intelligence” (). Stigmergy and swarm intelligence have been extensively studied in a wide variety of applications (), mainly in robotics (, , ), and optimization problems (, 14]). Valuable and extensive analyses of the mechanisms of stigmergic interactions in multi-agent systems (MAS) are available in (, ). In this paper, we discuss the stigmergic interactions between human agents from a slightly different perspective: we consider the case when the agents share not just a common environment, but also some mental representations thereof – cognitive maps. The core idea of the research described here is that the processes of self-organization called „swarm intelligence” can be triggered by building – through the collective effort of the whole population of agents – a „global cognitive map” stored in the distribution of traces created by the agents in the environment. We outline the elementary operations and the technological means to automate the process of creating and sharing the collective cognitive maps in order to induce stigmergic behaviour in human MAS. Section 2 is a brief presentation of the conceptual framework that explains the connections between cognitive maps and stigmergy. In Section 3 we explore the possibility to automate the collective creation of shareable cognitive maps. Section 4 is reserved for conclusions. AXENIE, C., J. CONRADT, Cortically Inspired Sensor Fusion Network for Mobile Robot Egomotion Estimation. Robotics and Autonomous Systems, 2014. BENI, G., J. WANG, Swarm Intelligence in Cellular Robotic Systems. In: Robots and Biological Systems: Towards a New Bionics?, Springer Berlin Heidelberg, 1993. pp. 703-712. BONABEAU, E., M. DORIGO, G. THERAULAZ, Swarm Intelligence: from Natural to Artificial Systems. Oxford University Press, 1999. CASTELFRANCHI, Cristiano. Silent Agents: From Observation to Tacit Communication. In: Advances in Artificial Intelligence-IBERAMIA-SBIA 2006. Springer Berlin Heidelberg, 2006. pp. 98-107. CHIALVO, D. R., M. M. MILLONAS, How Swarms Build Cognitive Maps. In: The biology and technology of intelligent autonomous agents. Springer Berlin Heidelberg, 1995. pp. 439-450. DORIGO, M. (ed. ), Ant Colony Optimization and Swarm Intelligence: 5th International Workshop, ANTS 2006, Brussels, Belgium, September 4-7, 2006, Proceedings. Springer Science & Business Media, 2006. DUNBAR, R. IM., Coevolution of Neocortical Size, Group Size and Language in Humans. Behavioural and brain sciences, 1993, 16.04: 681-694. GRASSÉ, P.-P., La reconstruction du nid et les coordinations interindividuelles chez Bellicositermes natalensis et Cubitermes sp. La théorie de la stigmergie: Essai d’interprétation du comportement des termites constructeurs. Insectes sociaux, vol. 6.1, 1959, pp. 41-80. HEYLIGHEN, F., Stigmergy as a Universal Coordination Mechanism: Components, Varieties and Applications. Human Stigmergy: Theoretical Developments and New Applications. Springer. Retrieved from http://pespmc1.vub.ac.be/papers/stigmergy-varieties.pdf, 2015. KARLSON, P., M. LÜSCHER, ‘Pheromones’: a New Term for a Class of Biologically Active Substances. Nature, vol. 183, 1959, pp. 55-56. LESTER, J., T. CHOUDHURY, G. BORRIELLO, A Practical Approach to Recognizing Physical Activities. In: Pervasive Computing. Springer Berlin Heidelberg, 2006. pp. 1-16. MUBASHIR, M., L. SHAO, L., SEED, A Survey on Fall Detection: Principles and Approaches. Neurocomputing, vol. 100, 2013, pp. 144-152. NEGULESCU, S. C., I. DZITAC, A. E. LASCU, Synthetic Genes for Artificial Ants. Diversity in Ant Colony Optimization Algorithms. International Journal of Computers Communications & Control, vol. 5(2), 2010, pp. 216-223. NICULESCU, A., G. THORSTEINSSON, Enabling Idea Generation through Computer-Assisted Collaborative Learning. Studies in Informatics and Control, vol. 20(4), 2011, pp. 403-410. O’KEEFE, J., J. DOSTROVSKY, The Hippocampus as a Spatial Map. Preliminary Evidence from Unit Activity in the Freely-moving Rat. Brain Research, vol, 34(1), 1971, pp. 171-175. OMICINI, A. et al. A Conceptual Framework for Self-Organising MAS. In: WOA. 2004, pp. 100-109. PARUNAK, H. V. D., A Survey of Environments and Mechanisms for Human-Human Stigmergy. 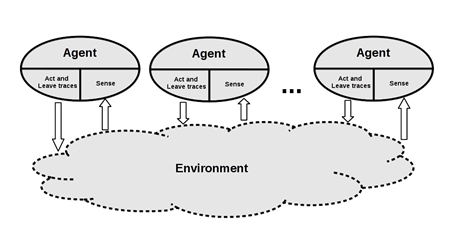 In: Environments for Multi-Agent Systems II. Springer Berlin Heidelberg, 2006. pp. 163-186. PARUNAK, H. V. D., S. A. BRUECKNER, The Cognitive Aptitude of Swarming Agents. Vector Research Center, Ann Arbor, MI, 2009. SUSNEA, I. et al. Virtual Pheromones for Real-time Control of Autonomous Mobile Robots. Studies in Informatics and Control, vol. 18(3), 2009, pp. 233-240. SUSNEA, I., G. VASILIU, D. E. MITU, Enabling Self-Organization of the Educational Content in Ad Hoc Learning Networks. Studies in Informatics and Control, vol. 22(2), 2013, pp. 143-152. SUSNEA, I., Engineering Human Stigmergy, in press (to appear in International Journal of Computers Communication and Control ISSN 1841-9836, vol. 10 (3), June, 2015. TOLMAN, E. C. Cognitive Maps in Rats and Men. Psychological Review, vol. 55(4), 1948, p. 189. THRUN, S. et al. Robotic Mapping: A Survey. Exploring artificial intelligence in the new millennium, 2002, pp. 1-35.